China really felt the hesitant mood today with the main Shanghai index down 1.6% and the Hang Seng fall over 2%. President Trump really was doubling down on the speech play late US/early Asian time zone and the markets reflected the mood. South Korean KOPSI dropped 1.7% in todays trading and also the SENSEX gave back another 1% by the close. Many are concerned what may or not be said over the weekend and so the majority of todays selling was referred to as long liquidations. 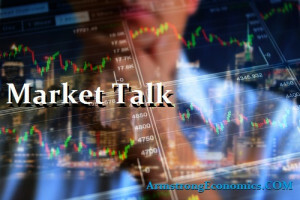 Japans market were closed for a national holiday but we did watch the JPY trade back to the 109 level again, as the flight to safety continues with gold and treasuries also bid ahead of the weekend. We also saw the oil price pressured again trading back close to the $48 level. It has not been a great trend for core European indices with many falling over 2.5% on the week. We saw another poor day today primarily caused by the continued geopolitical nervousness as we watched markets like FTSE, IBEX and CAC all fall by over 1%. Miners, energy and tech stocks bore the brunt of these declines with Arcelor Mittal declining over 4.5%. Worth keeping an eye on the iron ore price especially in the region surrounding China, N. Korea and Japan as it sees over 80% of the steel shipments. Iron ore is back in the black for the year having recovered from a 30% decline back in early June. If this does escalate commodity markets will be hugely impacted. Oil down 1.65% on the week. Gold up by 2.5% on the week. US CPI was the main talking point and the reason given for turning the index as ahead of cash was in negative territory. The release came in below expectation with a increase of just 0.1% in July against an expectation of +0.2%. The market took this as a wait and see mood to be reflected upon the FED, but maybe the FED is following the wrong model – maybe the Philips Curve is outdated; tech has a lot to answer for! Fed Funds for December reflecting a 25% chance of a rise come year end. US core did fall back from its days highs as we entered the close but remains concerned over possible weekend headlines. Next week we have earnings announced from Walmart which should draw some attention after we saw JC Penny losing 17% in todays trading. Mondays market will be weekend headline sensitive. FED minutes released next week also. 2’s closed 1.29% (-4bp), 10’s 2.19% (-1bp), 30’s 2.78% (u/c), Bunds 0.38% (-3bp), closes the US/Germany spread at +181bp (+2bp). France 0.67% (-4bp), Italy 2.02% (u/c), Greece 5.46% (+4bp), Turkey 10.55% (+4bp), Portugal 2.78% (-2bp), UK Gilts 1.06% (-2bp).